Please use this Video created by Kristin Rausch to assist you with the Registration Process. To receive awards at the State competition, ALL schools are required to complete the Registration process. Each station must be checked and completed for your school to be registered. Guest Registration can be handled one of two ways. (1) Chapters may register their guests as part of their school registration. (2) Guests may also be registered and invoiced directly using EventBrite. 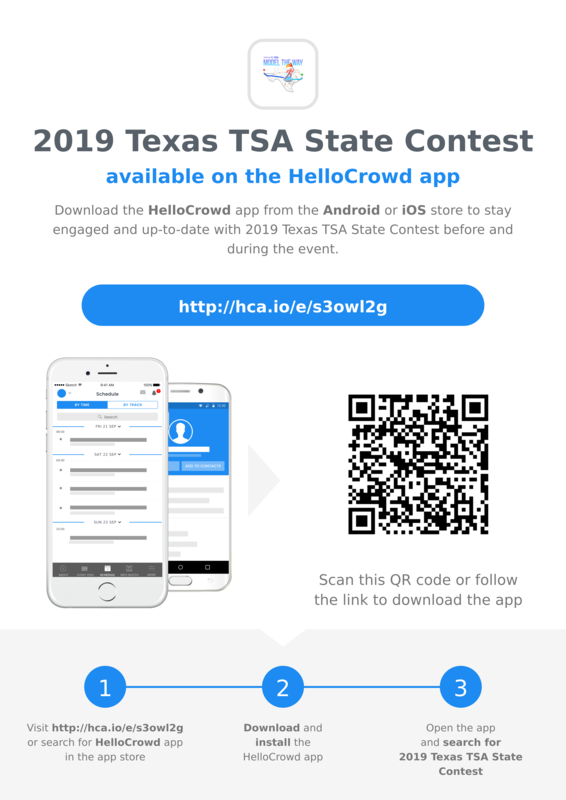 Download the HelloCrowd app from the Android or iOS store to stay engaged and up-to-date with the 2019 Texas TSA State Contest before and during the event. Click here! All hotel rooms will be booked through the Texas TSA hotel block. Any school booking outside of conference block will incur a penalty of $100/attendee registered for that chapter. Additionally, all schools participating in on-site events, will be required to stay on-site in the hotel block. The only exception to this policy, are schools who are within a 20 mile radius of the Fort Worth Convention Center. Bus Parking, Box Truck Parking and Project Parking (prior to project check-in) must purchase a Parking Pass. Parking Passes are $50 per vehicle and are purchased through the Conference Registration system. The FWCC will NOT allow the parking of any box truck, trailers or projects in the FWCC parking garage. The address is 1522 Rockwood Lane Fort Worth TX 76114 (behind the Fort Worth ISD service center on Rockwood Lane)– There is paid Security on this lot and it is the BEST option for your project parking. When you check in you will be given entry labels to be attached to your entries. One designated person from each region has been tasked with getting the data turned in on or before March 26, 2018. Labels should be placed on the back of projects or portfolios. For onsite events with no portfolio, your label will be used an entrance ticket. Please read the following two attachments regarding rules and adjustments to NQE events for State. Please pass on this information to your students. More information about Pre-submit competitions will be posted as the competition date gets closer. Registration is required for. Instructor must turn in the completed exam registration sheet before 2 p.m., To the registration desk. We need a list of your student(s), their ID #, and the test and/or graphic solution(s) they will each be taking. It helps if you have them broken out according to session #1 or session #2 also. Each qualified student will then receive a pass to enter the exam. Please use the prescribed form for Texas Projects Documentation. All TSA Members will adhere to the National Code of Ethics as stated on the national website. Orders will be accepted between March 1 – April 22. Use this TX TSA Pre Order Lunch 2019 to complete all pre-orders. Lunches will be available daily at 11:30 am for pick-up at the Fort Worth Convention Center. Six Flags did not anticipate the number of schools who would be paying by check. Therefore, they have amended the order information with a form for you to use if you are paying by check. Only use the direct link if you are paying by credit card. All other forms of payment need to use the attached form. Deadline to order is Friday, April 19. Tickets will be distributed on Friday, April 26 at the State Conference. All payments must be received by April 24, 2019. Texas TSA State Conference Event is now signed up for savings! Just log into your own Six Flags site to buy tickets with substantial savings off the main gate price. This online benefit program offers not only substantial savings, but allows you to “print and go” so you have your ticket in hand when you get to the park with no waiting in the line to purchase tickets. The 2018-2019, minimum dress requirements for NQEs at State Contest will follow National TSA requirements as defined in the National TSA Competitive Events Guide. No exceptions will be made. 1. The official TSA royal blue dress shirt is required. See rules for specific event for tie and jacket requirements. 3. Black dress shoes or dress boots – females can wear open-toe shoes or dress sandals – No flip-flops. 1. Students are required to wear a shirt with a collar, button up or polo. No logos on shirt, except for TSA logos (Chapter, State, or National) will be allowed. 2. Pants must be without holes or fraying. Jeans are allowed providing they are free of holes and tears. NO shorts allowed at any time during the conference!